Hi, Jackie here from Teal & Lime. I am dropping in today with a little St. Patrick’s Day cheer for the lunch box! When I was growing up I always wanted to have the perfect thing to wear on holidays and special occasions. You know, pink or red to wear on Valentine’s. And, especially, a green shirt to wear on St Patrick’s Day. Because, I am proudly 3/4 Irish…I have the freckles and a red-haired father to prove it! I loved wearing my green shirt and a sticker or button that said “Kiss me, I’m Irish!” Any holiday that involves green beer and puckering up is too much fun to ignore, whether you are Irish or not. Now that my oldest son is in school, every minor holiday is a big deal. But, he wears a uniform. So, there is no green shirt, or sticker or button. I wanted to find a fun way for my son to show off their Irish pride at school, and maybe over breakfast at home. 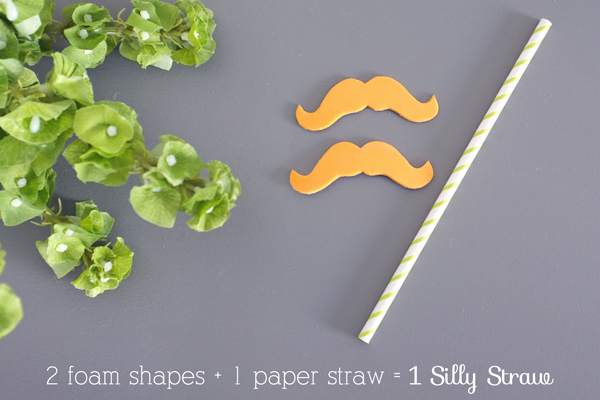 I got this idea when I passed some silly leprechaun mustache straws at Target. What a fun idea! They were only a couple dollars, but I knew I could make my own in a few minutes and with things I already had on hand. I plan to put two straws in his lunchbox and he can choose which to use or share one with a friend. One has an orange leprechaun mustache and the other is green puckered lips with an appropriate St. Patrick’s Day message. 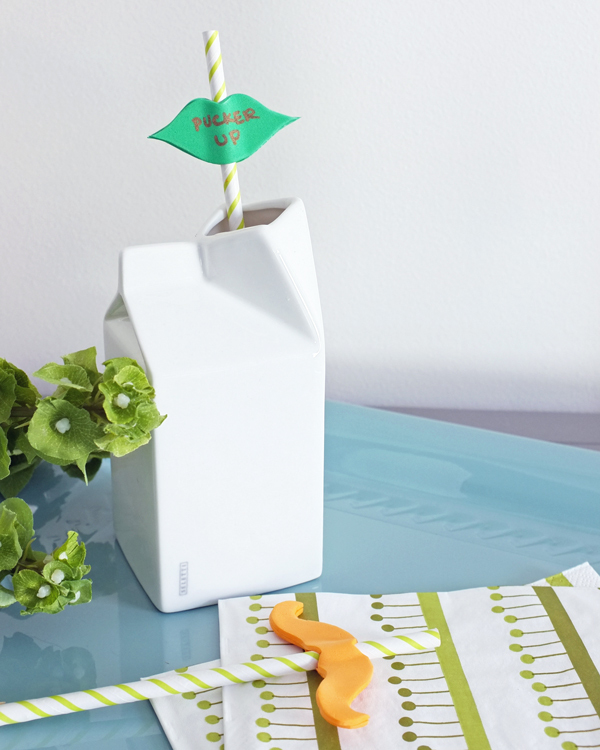 This is one of those under 5 minute projects that you just know is going to bring a smile to your kid’s day! 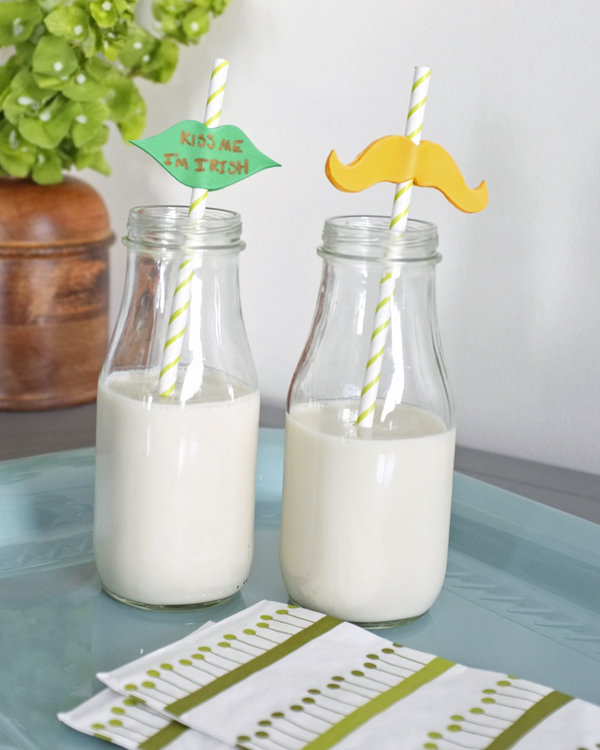 To make this as easy and quick as possible, I used peel and stick foam to make the straw decorations. 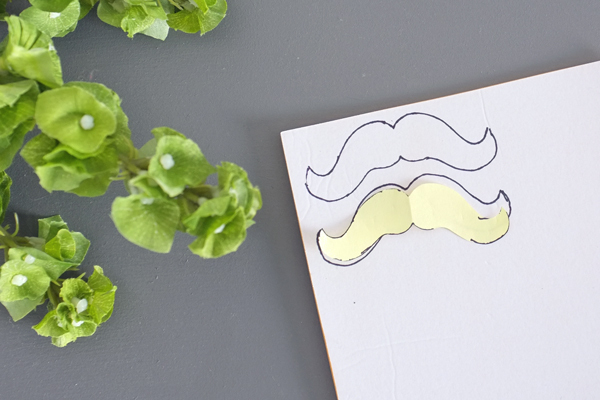 First, I sketched out the mustache and lips on a piece of scrap paper to serve as a template. Tip: Fold your paper in half and draw half the shape next to the crease. Cut it out and reveal the full, and perfectly symmetrical shape. I drew a mustache and lips. Then, trace around your template on the paper backing of the foam. Carefully cut out each shape with sharp scissors. 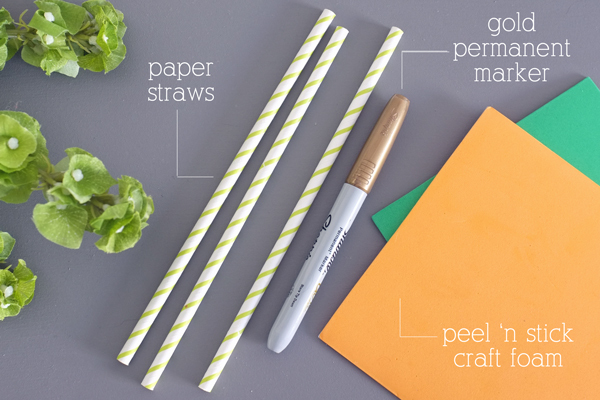 Peel the paper backing off one piece and set the drinking straw in the middle with about 2 inches sticking up above the shape. Remove the paper backing from the other piece and Carefully line up and press the other foam piece to the back. 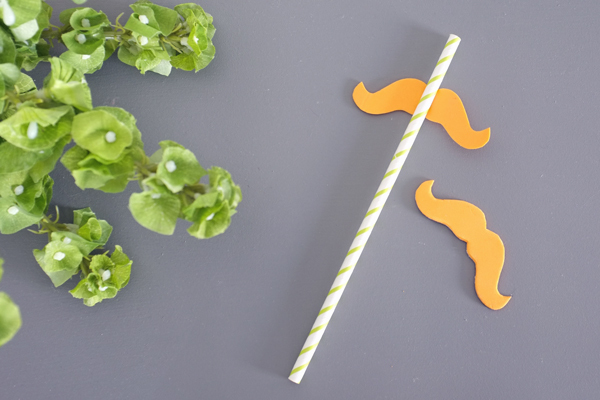 These straws are double-sided cuteness! 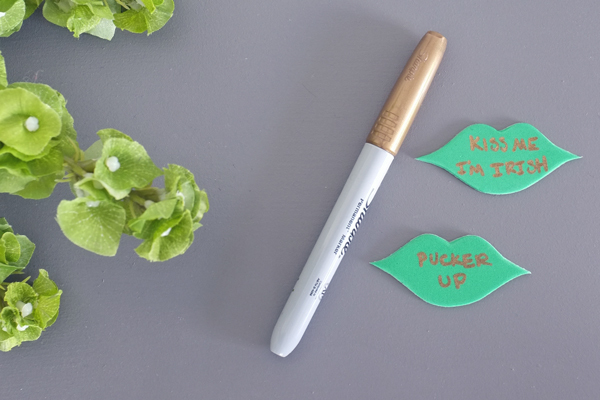 On the lips, I used a gold permanent marker to write “Kiss Me, I’m Irish!” On the back side, I wrote “Pucker Up”. 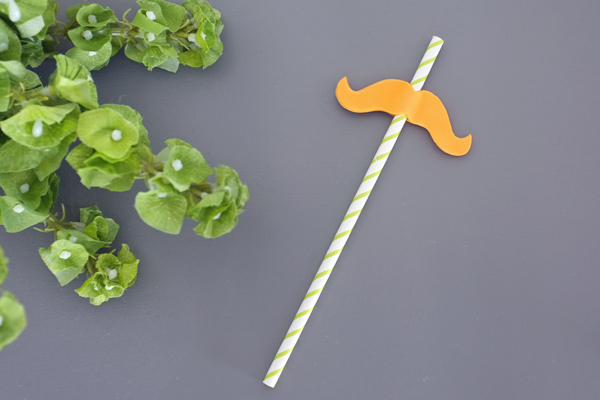 I am looking forward to St. Patrick’s Day to bust out these silly straws. I know both of my boys will find it way too funny to have an orange mustache or big puffy green lips. Reminds me of the Silly Sucker Valentine’s we made a few years ago with foam lips and mustaches around the stick. 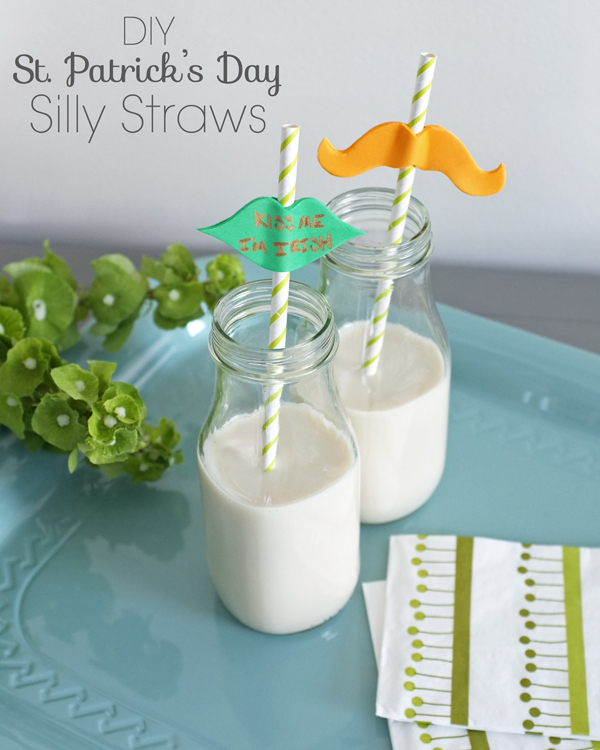 With these silly straws and Kristen’s St. Patricks Day Lunch Jokes, you are all set to pack the perfect St. Patty’s Day lunch!